Oh Mexico! 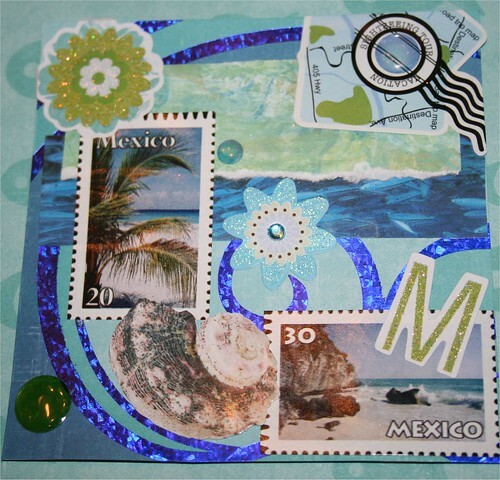 4" x 4" collage, originally uploaded by DianthusMoon. We went to Cancun back on our honeymoon in 1984. Never been out of the country since then. It was very exotic and wild too. We stayed in a place overlooking the gulf and the water was crystal blue. One day we went to the ruins which was an hour’s drive straight through the jungle You’d see little huts with antennas coming out of their roofs. Sean found these ‘stamps’ at the thrift shop we went to yesterday on the $1 table. I used some of my homemade paper and also the school of fish that I used the bottom of yesterday. 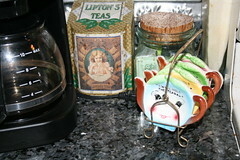 My vintage find was the little teabag holders. I’d say they have to be at least from the 1960s, not sure. There are a few chips out of them, but they are a complete set. Too cute. 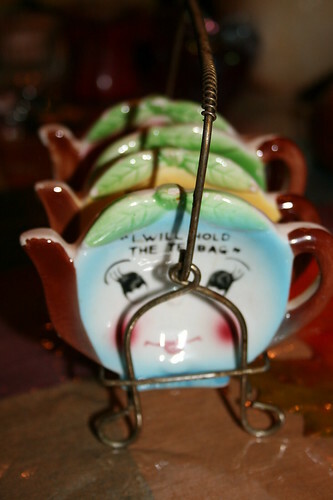 love the tea bag holders–super cute!